Thinking of getting your own video? Check out our animated video page for more information and video examples. Sure, he may have been talking about saving Gotham City in a Hollywood blockbuster; but his words are a testament to the power of an amazing script. And that’s a power that applies whether you’re creating a box office smash – or a first-class online video. In any video project, the script is the foundation upon which everything else is built. It’s the first building block, the starting point, the single source of truth. It’s everything. Your script needs to grab attention; it needs to be clear and concise. It’s where the big decisions are made. And while the execution is just as important as the idea – if your ideas are wrong, no amount of technical proficiency later in the process is going to redeem your video. The thought of writing a new script from scratch can be quite daunting, and it’s even worse if you don’t have much writing experience. So if you continually find yourself staring at a blank piece of paper or computer screen, read on to discover all the tricks of the trade to help you create an amazing video script. What is a video script? 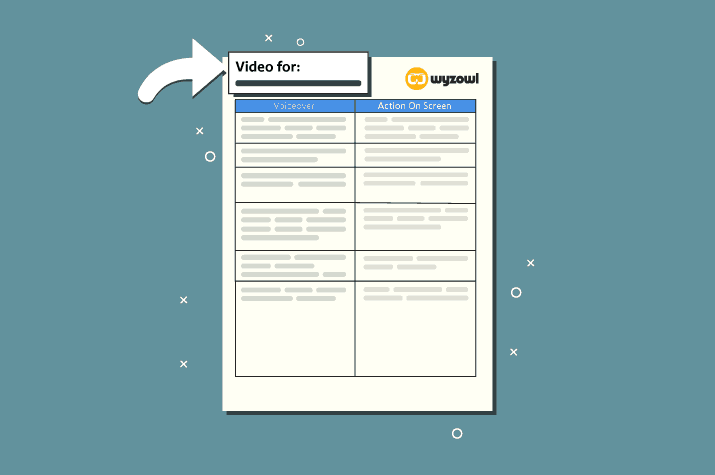 A video script is the blueprint and foundation for your digital video. It’s a chronological run-down of scenes, action and dialogue that you want to appear in your video. 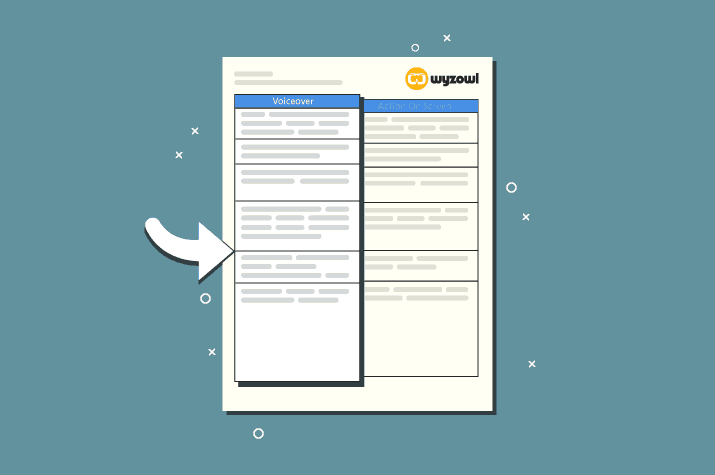 At Wyzowl, we’ve created a simple but powerful script document. It lets us set out the voiceover on the left and the action on screen on the right. This keeps both sections separate and easy to follow, side-by-side. Why write a video script? It allows you to plan your messaging – Creating a video is an exciting process, and we know you have a LOT to say! Writing a script is a fantastic starting point – a first step that allows you to whittle down thousands of competing ideas into one coherent structure. You can start to plan exactly what you want to say in your video – and how you want to say it. It lets you estimate (and manage) video length – We work to the rule that a well-paced professional voiceover is read at around 130 words per minute. 130 words of voiceover generally equates to a minute-long voiceover track. When you know this, it gives you a great way to manage the breadth of the content you want to cover, while considering the length of the video and how that will resonate with your audience. It saves (sometimes MASSIVE amounts of) time – Another important aspect of writing a video script is the ability to make changes quickly and smoothly. The problems you will encounter trying to change any footage while the video is in post-production can be timely and expensive. However, any mistakes you make in the script, or scenes you’d like to change, can be actioned within seconds using the trusty backspace key. It facilitates collaboration – When making a video for your business, a lot of different people may want to have their input. By writing a script – and inviting feedback on it through a collaborative tool like Google Docs – everyone can chip in and have their say on what to include and cut from the script. This allows you to get buy-in across the organisation and harness the power of different voices and perspectives. Ok, so hopefully, you’re sold on the value of a script. Now, let’s talk about how to write one. As with anything creative, it’s imperative that you have a basic idea of what you are hoping to create. Failing to plan at the script stage could lead to unexpected costs further down the line. If you come across any problems at the script stage, you can easily tweak and change and even start again. However, if those changes need to be made once the video has been recorded, illustrated, animated or recorded by the voiceover artist, then you could incur further costs. 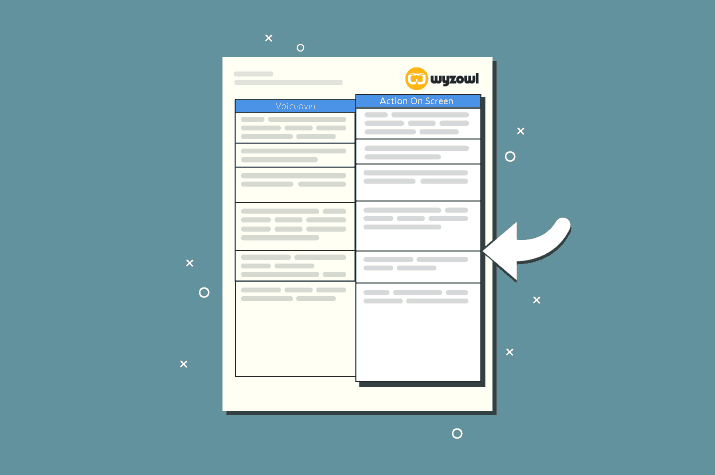 At Wyzowl, we ask our clients to complete a short brief form before we write their script – and we also fill out this form ourselves for our internal video projects. It asks just the right questions to unpack everything you need to think about when writing your script. By defining the right information at the brief stage, the script process becomes a structural exercise where it’s just a case of laying out the points you’ve identified in the most impactful way possible. What the video is about. Where the video will be used. Based on this information, you should have enough to put together a first draft of the script. If you’re really struggling to know where to start, this simple formula might be helpful. Of course, no two videos are exactly the same, but this classic formula for an introductory explainer video helps us get started time after time. 1. Audience/Problem – Start by defining the pain point your product or service has been introduced to overcome. Massage and elaborate on this problem; what does it mean? How is it manifesting itself in your target audience’s life? How is it holding them back? 2. Solution – Introduce your product or service and explain briefly how it solves this problem. 3. Benefits & USPs – Run through 3-4 of your main benefits and USPs that differentiate your product or service from the competition. 4. Call To Action (CTA) – It’s impossible to get across everything about your product or service in 60 seconds, so at the end of the video, you really need to give your viewers a ‘signpost’ to nudge them along to the next step in your sales journey. Make sure to include contact numbers, website addresses, email addresses and anything else you think might be relevant to ensure the viewer takes further action. We all know that, when we’re passionate about something, talking about it is easy. And not just that – we’ll talk about the things we’re interested in at length and in great detail. That isn’t always a good thing when it comes to writing a video script! You’ll quickly find yourself fighting a natural instinct to include every single benefit of your product or service. Particularly for promotional video content like an explainer video or video ad, you’re battling against the attention span of your audience. The below graph from Wistia illustrates the extent to which engagement tails off as a video continues to play. There’s a particularly sharp drop off after 2 minutes, and we’d certainly never recommend creating an explainer video that’s longer than that, except in special circumstances, such as at an event where you have an audience that has opted in to watch your video in its entirety. Videos can hold attention for longer if there’s an opted in audience, or if your video content is informational or educational – documentary style content, or ‘how to’ guides. There are tons of different ways to make a great video. But whether it’s live action or animation, one thing always rings true; it needs to catch the eye. Not so long ago, provided your content added value, it didn’t matter as much how it looked. Nowadays, everything needs to look beautiful. And you can be sure, if it isn’t, the viewers’ perception of your brand will suffer. Injecting that little bit of fun into your video script can make all the difference. Ultimately, you have to remember: people don’t have to watch. A boring, sterile video is highly likely to turn your audience off. And let’s face it – there are plenty of other ways they could be spending their time. If you make your video fun, lively and engaging, you can help create the kind of impact that simply keeps them watching. You don’t want your video to sound like the voiceover is just reading a list or bullet points. Read your video script aloud a number of times to ensure this doesn’t happen. This process will allow you to identify any areas for improvement. You may feel a bit embarrassed reading your script aloud, but it’s the best way to ensure your timings are correct and that it makes sense and runs smoothly. The people who make it to the end of your video are precious. They are the people who are clearly interested in what you have to say – and it’s absolutely crucial to capitalise on that interest by signposting them in the right direction. That’s why we always recommend ending your video with a clear call to action. This can be anything from contacting you for further information to downloading your app. The call to action appears at the end of the video and remains on screen for a few seconds for maximum effect. You can also end your video with a vocal CTA to accompany your final image to hammer home the point you want to make. Check out 25 Proven Call-to-Action Words to Maximize Conversions for more inspiration. Here at Wyzowl, we’ve created over 2,500 explainer videos using the above guidelines. Below you can see that the way we write our video scripts are done in two parts – voiceover and action on screen. These parts are written in tandem, using the word count of the voiceover to estimate the length of the video, while you can set out all your creative ideas on the action on screen section. All our video scripts are written in Google Docs – as this allows us to share our work and allow others to collaborate on it, whether that’s colleagues or clients. All feedback is essential in creating the best video possible. This document formalises the plan for the video and gives our illustrators and animators all the tools they need to go ahead and make this very simple document into an all-singing, all-dancing animated video. Again, use this rule to measure and estimate the length of your video. 130 words is almost always equal to around 1 minute of voiceover. This is a great pace; the audience is able to follow and understand, and it allows plenty of room for movement on the screen to accompany the points made in the voiceover. Most people find writing a bit unfamiliar and scary. Luckily, there are tools out there to help. Grammarly is a go-to tool for most writers. It’s an online grammar checking, spell checking and plagiarism detection software to avoid unnecessary mistakes, while the Hemingway App highlights any errors and provides tips on how to tighten up your copy – this tool follows the principles used by writer Ernest Hemingway, who was known for his simple, direct prose. We may not all be artists, but we definitely all need inspiration! We find it helps to watch great examples to get inspired, and Dribbble is extremely useful when you are creating an animated video. It’s an invite-only design community which means only the best illustrators publish work on it, and it can help you discover creative ideas for illustrations that demonstrate the subject matter of your video. Keep to the 130 words per minute rule to manage your video length, and use the various tools that are out there to help inspire and improve your work. Here at Wyzowl, we understand the dynamics of creating top quality videos for your brand, so browse our blog for more helpful guides, or get in touch today if you want to tap into our expertise.